U.S. News and World Report released their 2020 rankings of graduate programs. The 2020 U.S. News and World Report Best Graduate School rankings were released today. Family Medicine was the highest ranked of all University of Michigan Medical School specialties, ranked third in the nation. 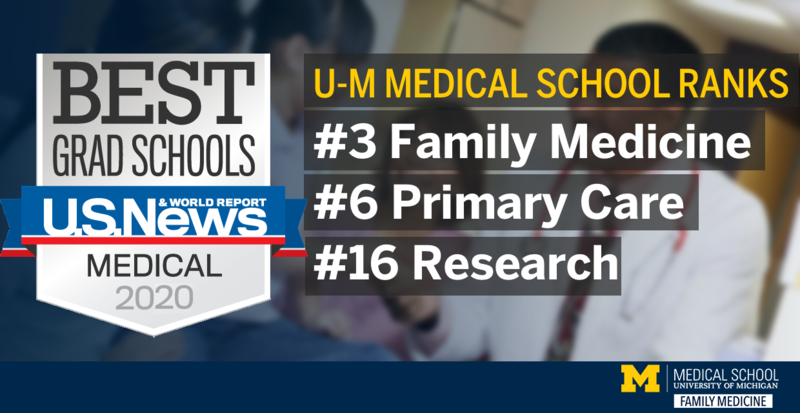 The University of Michigan Department of Family Medicine received a boost in rankings in the latest 2020 U.S. News and World Report annual Best Graduate Schools list. U-M Family Medicine is now third in the nation among medical school family medicine specialty programs. At No. 3, Family Medicine was among many highly ranked specialities at the University of Michigan Medical School. U-M Internal Medicine, Obstetrics and Gynecology, and Surgery all ranked No. 6, Anesthesiology at No. 7, and Radiology at No. 8. Pediatrics and Psychiatry both rank No. 13. "It's an honor to be ranked #3 in the country. This is a testimony to the work of amazing faculty and staff in Family Medicine, and truly exemplifies the Michigan way. It really is, as Coach Bo Schemblecher said, The Team, The Team, The Team!" Philip Zazove, M.D., the George A. Dean, M.D. Chair of Family Medicine. The Department has held a spot in the top ten family medicine programs for well over a decade, with a steady rise over time (ranked No 4 in 2018, No 8 in 2017). The rankings are a testament to the consistent and outstanding work happening in the Department’s patient care, education and research missions. Rankings for the University of Michigan Medical School's overall training and research capacity were notable, as U-M ranked sixth in the nation in training primary care physicians and 16th among research medical schools. According to 2018 public data on grants awarded from the National Institutes of Health, compiled by the Blue Ridge Institute for Medical Research (BRIMR), the University of Michigan Department of Family Medicine attracted $3,157,088 in NIH grants in 2018, ranked 7th among family and community medicine departments in overall NIH grant funding. Additionally, faculty from the department published over 150 scholarly articles indexed in PubMed in 2018.  More information on the University of Michigan's U.S. News and World Report rankings can be found in the Michigan Medicine Headlines.